Melissa Novoa is the paralegal and office manager for Bounds Law Office. As a paralegal Ms. Novoa quickly established a successful legal career. Her legal background includes, but is not limited to: corporate, civil, commercial, foreclosure, and probate litigation. Melissa exerts a high level work ethic and noteworthy integrity. Prior to joining the firm, Ms. Novoa was a paralegal at Carey Rodriguez Greenberg O’Keefe, LLP. Before that, she was a legal assistant for Mr. Bruce M. Bounds and various other attorneys at Rafferty, Kobert, Tenenholtz, Bounds & Hess, P.A. 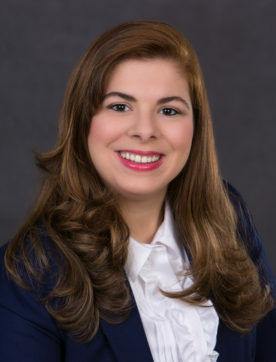 Ms. Novoa received her Associates in Science Degree for Paralegal Studies, approved by the American Bar Association from Miami-Dade College in 2010. She also earned her Associates in Science Degree in Legal Secretary and a Certificate in Legal Office Management in 2007. In 2006, she received two more Certificates as a Legal Office Specialist and Legal Office Support Specialist. Melissa currently holds her Florida Notary License. Click here for Melissa Novoa vCard.